When you’re planning a move into your new home – there’s so much to think about. From hiring movers to clearing out clutter, changing your address to thinking about furniture placement. It’s understandable that you might not think about moving one of your most prized treasures – your pet! Pets are perceptive and understand that changes are taking place in their home. Here are a few ways to ease the stress during the transition and plan for the big day. Try to pack up the pet’s things last. If they typically spend time in one room of the house, leave that one to be packed up last and don’t keep boxes in their usual hang out spaces. If a move will require your pet to spend some time in a crate – get them familiar with that space again if they don’t spend much time there. Have occasional meals in the crate or go for short road trips in the crate so the moving day won’t come as a complete shock. 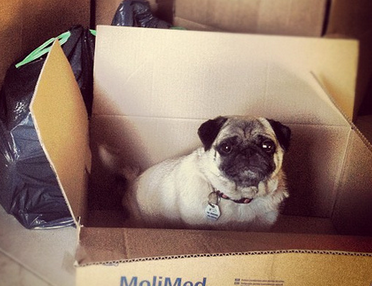 On moving day – try to find someone who can keep your pets. This will prevent concerns about them running away while doors are open and furniture is being moved. If it’s not possible to have the pets at a different home, keep them in a locked room and peek in for frequent checks. Once you’re in your new home, your pet will need to investigate the new surroundings to get comfortable. Ease this transition by introducing your pets to one room at a time. Have their food and toys in that one room and use this as a home base they can become easily comfortable with. When they are ready to explore more, leave some doors shut so that your pet doesn’t become overwhelmed in a completely new space. Introduce just a few rooms at a time. With a little understanding and patience, the whole family will be adjusting to the move in no time!